Wireless security cameras with computer monitor is basically a security monitoring system within itself. Wireless security cameras with computer monitor can be used in residential applications as well as business or industrial applications. 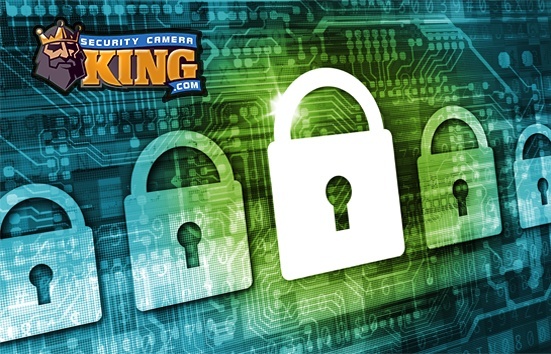 Thanks to innovative advances in both computing and electronics, wireless security cameras can be used just about anywhere and can be viewed using a standard computer monitor. 1) The digital video camera captures video images. 2) The digital video images are transmitted to the receiver by the camera using the built-in transmitter and on-board antenna. 3) The receiver accepts the cameras transmission and provides the necessary out connections to a computer monitor. 4) The computer monitor is used to view the images sent to it by the receiver. There are many varieties of wireless digital video cameras. Cameras may be indoor or outdoor types. Outdoor cameras are basically indoor types with a protective cover or case. Outdoor cameras normally provide protection from dust, water, weather and other environmental elements. Outdoor wireless security cameras are excellent for monitoring area perimeters, driveways, industrial structures, entrances and exits, and many other areas. Wireless indoor cameras are great for use anywhere that cabling may be difficult or unsightly. This can be used in offices, retail stores, schools, in the home, as baby cams and so on. The camera transmits its image using the 2.4 or 5.8 GHz radio band technology and has a Line Of Sight or LOS range. A LOS range means the range listed for the maximum distance between the camera and receiver is if there is nothing blocking the sight between the two. In other words, the LOS range means the maximum distance the camera can be separated from the receiver provided you could see the camera from the receiver’s position or you could see the receiver from the camera’s position. Some wireless cameras may have specified ranges of a mile or two. If an object is blocking the LOS, the range will usually be reduced, depending on the makeup of the object. Wireless security cameras that are used with a computer monitor can have highly sensitive image chips that allow it to work in different lighting conditions. The electronic sensor chips that are used are either a Charge Coupled Device or CCD or a Complimentary Metal Oxide Semiconductor or CMOS. Wireless security cameras that contain these specialized highly sensitive chips can be either day/night vision cameras or night vision infrared cameras. Day/night vision cameras can produce a high quality color video image in conditions with very little visible light. These cameras are often rated in “lux;” a unit of measurement of the intensity of light. Some cameras have a rating of .002 lux which is equivalent to the amount of visible light available on a clear, moonless night. Night vision infrared cameras can produce a high quality color video image when there is enough visible light. However, when there is no longer enough visible light, these cameras switch to infrared mode. The cameras usually contain a group of infrared Light Emitting Diodes or LEDs that shed infrared light on the target area. This light is infrared radiation so human eyes cannot see it but the camera’s sensor chip can. 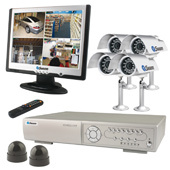 Infrared wireless security cameras with computer monitor also have a target distance range. This range is how far the camera can “see” in total darkness. Make sure you check the range of the camera before purchasing to make sure it has an adequate range for your application. Since the illumination is actually in the infrared spectrum, the video image produced is still a high quality video image but it is monochromatic, that is it lacks color.